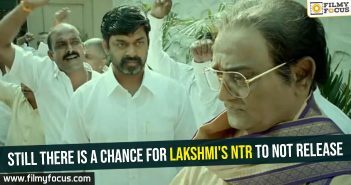 Ram Gopal Verma has shaken a honeycomb by announcing Lakshmi’s NTR and trying to project it as the ultimate truth in an aggressive way against Andhra Pradesh Chief Minister, Nara Chandrababu Naidu. He said that the movie will release in theaters for sure, no matter whoever tries to stop it. One person, who proclaimed to be a fan of TDP Chief NCBN said that he will go to any length to stop the movie release. The person asked CBFC to not certify the movie and also ban it from releasing. RGV immediately applied to the CBFC for certification. The board has denied processing his application submitted on 11th March as elections code is applied from the day. RGV on the social media announced that he is filing a legal case against CBFC as this comes under violation of his rights under Article 19 from the Indian Constitution. He announced the date of the release of the movie as 22nd March, let’s see if he will be able to find a way to release the movie on time or before 5th April.